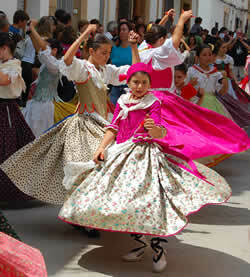 There are fiestas throught the year in Javea and I have listed the main ones below. The fiesta usually takes place in mid July - and it is a major event. Most of the action takes place down in the Port. Much of the town is pedestrianised for this so be ready to walk a bit further than normal. Head for the Promenade - where you will find the Tourist Information Centre and Poisto Restaurant (see a review of this Javea restaurant, and actually this Restaurant is a great place to enjoy a meal al fresco and watch the mayhem to follow. The fiesta takes place over 4 days. The main action usually takes place at about 8pm but there are other events during the day. The first evening the Moors invade from the sea (much canon fire in evidence! )(get used to it) and they fight with the Christians. Day 2 - more processions and shooting. Day 3 the same. Day 4 - the reconquest - the Christians win. During each evening there are tremendous processions of beautifully dressed participants and an incredible amount of shooting. If you have a baby, take ear plugs - these guys really love their guns! 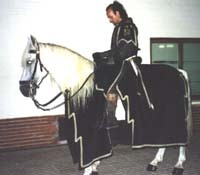 During the day there are also many events. Join the Moors for a sardine breakfast at 10am with Sangria and beer to wash it down. You will find lots of 'cofraderias' throughout the port area - little garages under apartment blocks which they convert into Moorish strongholds. They place white tents outside them and tables. Then of course, remember the fireworks - these come before brekfast - and they too, like the guns, are very loud. At lunchtime they usually make the biggest Paealla in the world. It's worth seeing how they do this. In the main plaza in the Port they set up loads of little wooden fires beneath a very large Paella Pan then they add in the rice, water, saffron etc. The Thursday night is the last night - and it's a long one - lots of bands, processions, guns (of course) but it really is a spectacle - I highly recommend it. The main fiesta in Javea which takes place in the old town and the port and features processions with floats, bull running, dancing in the streets and even the streets being painted. Join the party - you will be made more than welcome. I hope this is true - it was told to me and I think it is. 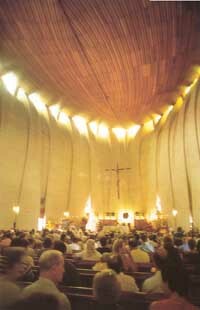 You may notice in the Port that the church is very modern indeed - not to everyone's taste perhaps - but very intersting. The story is that the fishermen were all out in their boats at sea when a terrible storm struck them - they were stuck out there for days and they prayed and prayed to the Virgin of Loreto to bring them back safely. If she did then they would work tirelessly to earn enough money to build a new church. Which, of course, they did. And thus you will see, if you step inside, that the ceiling of the church is shaped like a boat, curved wooden planks - it's uncanny.